After you have created your account and have gotten comfortable with the application, you may want to invite other coworkers into your D-Tools account. This is an easy process as you will just need to enter in the email address(es) of the the coworker(s) you want to invite. First go to the Users tab in the settings. Here you will find a list of all the users in your account. Once you have found the Users page, locate and click the green Invite User button in the upper right. This will open a modal to invite users. 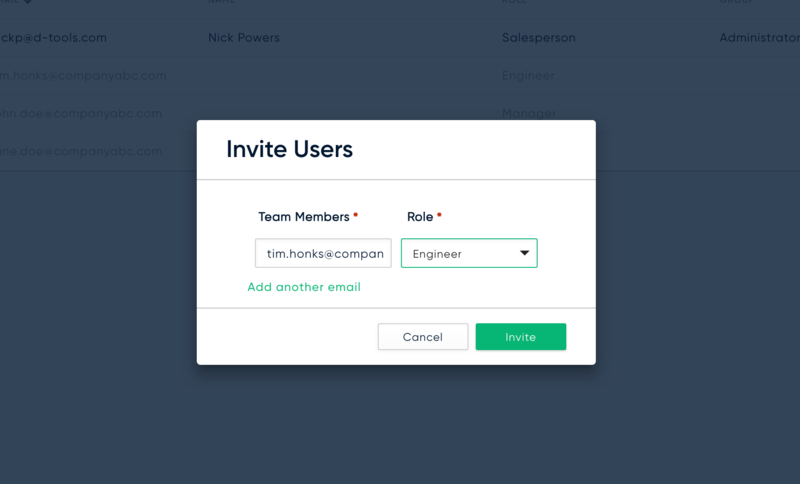 Type in your coworker you would like to invite into D-Tools and select their role in the organization. After you have invited this user, you will see a toast message that confirms the invitation was sent, and you will see them in gray in your users list. You can re-invite pending users.